Alluding to a link between rosacea and migraines, Dr. Joseph Bikowski says that aspirin should be the first line of defense against rosacea flushing. A recent article in Dermatology Times highlights the potential benefits (and risks) of taking low doses of aspirin, long term for rosacea swelling and flushing. An informal study with his rosacea patients who took a daily aspirin (81mg) reported less flushing and shorter episodes of erythema. 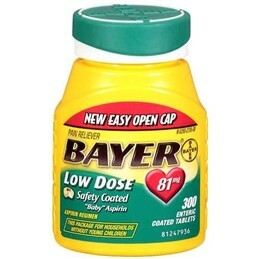 Dr. Bikowski argues, “Aspirin therapy is safe. It’s great for the heart. It’s great for the colon. Why not the skin?” He further notes that there are few contraindications for aspirin use, it’s inexpensive and it can be taken in combination with most drugs. Taking an antihistamine about two hours before a meal may counter the effects of histamine, while aspirin may reduce the effects of niacin-containing foods in sufferers affected by these substances. And finally, Asprin forms part of Dr. Linda Sy’s rosacea swelling relief regimen. At bedtime: Take 1 baby aspirin; 1 chlor-trimeton(4 mg) and 1 tab of Tums (Calcium Carbonate , an antacid to offset the gastric irritating effect of the aspirin. one w/ Niacin (Niacinamide is fine) and 1 Tagamet (200 mg). During bouts of flushing, apply a cool (not cold) compress on face. Do deep breathing 10 times slowly. How about you ? have you take aspirin specifically for rosacea swelling or flushing ? did it help any ? I have found that Oracea works great!!! It is a little costly even with insurance, but has helped improve the swelling and some of the redness on my face. I started out with Finacea but it seemed to irritate my skin more when flaring and made the redness brighter. My doctor took me off the Finacea and said that it was causing overdrying and was irritating my skin too much. She now has me on just the Oracea and Elidel (a cream for eczema sufferers). The Elidel is supposed to help moisturize my skin in hopes to relieve the burning, itching, and redness of my skin. I have to admit that the Elidel in conjunction with the Oracea has worked well and my face isn’t soo red nor itchy. I am about to switch from Oracea to the generic doxycycline (twice daily) and am curious if anyone knows if there’s a difference in the results produced by generic doxy versus Oracea? My goal is to find a cure for this horrible disease. I was once a treasury analyst for a fortune 500 company, however, its hard to fit in when your face is constantly red. People would inquire about my face all the time. I litterally left my job because I couldnt stand the feeling of having a red face anymore. I tried killing myself because I started to hate myself. Its time to stand up. I am here for all of you. I will find a cure. My email is c_mckeighan@yahoo.com. I’m feeling that right now, I am ashame to be seen. I am trying a Chinese Remedy called Longdan xie Gan Wan. I just started taking it. I will let everybody know if it works. Grapefruits are also excellent for detoxing the liver. I pray that someday I will be able to overcome this horrible disease. i am 63 years old and only found out 5 years ago that my adult acne is actually rosacea and my terrible dry eye problem is actually ocular rosacea. i live in chicago so have access to top dermatologists and eye doctors. nothing has really helped either situation very much and i think i have tried everything. my skin is so sensitive that i cannot stand to have anything on it. it is still oily and breaks out though it’s not real noticeable. because of my eyes, i have not been able to use eye make-ups or creams for years. just recently, i started using thayers witch hazel that has rose water, aloe and glycerin since it is winter here. i use whole foods plain glycerin (with coconut oil) bar soap to wash my face . i can put plain aloe on my eyelids. my face actually looks a little more calm. however, if i get any exercise, even the witch hazel makes my face feel like it is wrapped in saran wrap and it (and especially my eyelids) get hot and red and sweaty. i just read all about treating for possible dermodex mites with tea tree shampoo. oddly enough, i already use dr. bronners tea tree soap for a body wash. i will experiment using it head to toe (especially as an eyelid wash) and report back. i hate to mess with something that seems to finally be helping but we’re always grasping at straws, aren’t we?also, have just read in a favorite women’s magazine about the possible connection between small intestinal bacterial overgrowth and rosacea. the article said one case of food poisoning could cause this condition. i do not know of anyone who has had more cases of food poisoning that me so i will give align a try and maybe ask my doctor about the test which sounds like a real pain. IPL’s helped a bit, KTP’s helped a lot!! Sunblock containing zinc oxide is a must every single day! If someone is suffering, please go get laser treatments. You deserve it! They work by reducing the capillaries…you reduce them and the redness gets less and less. KTP goes deeper in my opinion so I prefer to get those. Research natural ways of preventing angiogenesis so they are less likely to re-grow. Hi Rochelle I was just wondering what IPL’S and KTP’S are. IPL is intense pulse light therapy and LTP is a type of laser! I am 72 year old and am new to this site…I have suffered with rosecea since I was in my 30’s…I haven’t had a lot of skin problems, not riased bumps, so I can wear makekup to take care of that. I suffer with SEVERE ocular rosacea. Tried a host of prescription drugs but they do not, nor have they ever helped. I went in for a check up and went to see an Ophlapologist because I now have cataracts and need surgery but he won’t touch me until my occular roseacea is somewhat cleared up. His two prescritions, one was an anti-biotic called azasite and cost me $131 for a 12 day supply and I ordered it three times, (my insurance does not cover this drug), he also prescribed a steroid drops and my eyes, after a month, are worse than ever. I was considering accupunture and called around and one of them suggested I go to the health store and buy “tumeric” in bulk, powder form and I have been on it for6 days and she told me I should start seeing results in 2 weeks…I will have to wait and see. It only cost me $2.50 for approximately a 3 week supply, using on teaspoon a day. You can put it in food or water. I put it in a glass of water and get it all done once a day. My eyes have become worst throughout the years and now it is affecting the quality of my life, especially with the cataracts….I also wash my eyes out with a wash cloth and baby shampoo, use compressed hot packs for about 5 minutes in the morning and still on the steroid drops…I would like to hear comments on my new approach..Another accupunturist suggested the possiblity that system yeast could be a part cause of the problem, which I also have…Any thoughts on that???? I’ve been using a baby aspirin and antihistamine every day for my rosacea and it does work! I know there are long term use concerns about taking aspirin everyday but when compared to the skin damage and appearence of rosacea it’s worth that risk (just like any other drug you take you have to weight those options). What I’ve found is that if I take this combination before I drink red wine or eat some food that makes me flush, I no longer have that reaction at all. One other thing I’ve found is that the particular brand of Antihistamine was important too….not sure why that is. I found for myself Claritin was the better one. it seems to clear my stuffy nose too (which people have wondered if that was somehow related). Thanks for the info! I’ve read some blogs but not too many. I’ll have to try the rose water. Something else I’ve found recently that I’ve wondered about too. I have microdermabrasions done monthly at a doctor’s office but I recently bought the Neutrogena Microdermabrasion at home system and that seems to remove some redness as well. What is interesting is it says not to use it if you have Rosacea but I have had positive results and nothing negative with less redness. It said on the box it could progress the disease but totally is not happening to me this way and it makes me wonder if I don’t actually have rosacea and they’ve misdiagnosed me. Why I’m mentioning it is you mentioned the oils in your face so I’m wondering if my using this tools it removes a lot of excess oil (just guessing though). What I get confused about is the doctor’s say there is no known root cause but some people say mites, some say oil, some say congestion, etc…. I personally feel this disease could have many root causes with a similar result. My psoriasis was like that. I found out I was severly B12 deficient (below 270 and normal should be over 1000) and once I started taking the B12 shots I have not one patch of Psoriasis. My adopted mom has had psorasis since she was three and B12 did nothing for her and she was not deficient. I believe the skin reacts in the same way regardless of the cause and that is why so many people have to try many things to see what works for them and doctor’s can’t find one reason. Does anyone really know if these various factors play a role in rosacea or not OR were they misdiagnosed for Rosacea? Yes I know what you mean; there is definitely mystery surrounding rosacea… I have also noticed that different things work for different people. I have found that limiting coffee and tea (or any hot drink) is quite helpful. But still…there are still periods where I hardly have any flushing at all, and then other times where for seemingly no reason, my cheeks are hot even if I am cold!! maybe hormones play a role, and in in 50 years they will discover the reason why some people are unfortunate enough to have this problem..
Well I have even better news for you then! I have figured out the cure for my rosacea and I haven’t had an issue with it in over a year. Long story on how I got there but I realized I needed more fiber. I know it sounds cliché but it’s gone. My face doesn’t even get red and swollen anymore when I drink wine (which was always a trigger in the past). I’ll try to explain what I believe worked for me with the hopes it might help someone else. I realized that, trying not to be TMI, that if your intestines are not cleaned (for a lack of a better word) then that toxin could sit on the colon wall and create fissures, which could lead to skin issues or food allergies. The skin is a direct result of your colon health. I started taking probiotics, a good brand not drug store, and increased my fiber to 20 + grams a day. Now my rosacea is completely cured. I do take some fiber pills and different named brands too, all seem to be okay. I happen to like the one from Natural factors though. How long after increasing your fiber did your rosacea go away? Yes – there are actually quite a few studies that correlate the skin impacts and the digestive system. I personally believe that we all get the same result but could have many root causes and that is why the doctors are never able to “cure” it. They do not focus on the root cause for illness but treat symptoms and they want a one size fits all cure. It won’t happen for autoimmune diseases. Each person could be different. However, if you notice that when you fast from food and the face becomes less red, it is probably related to the digestive system. When you wake up after a night of no eating, is the face less red? I’ve seen so many others talk about doing crazy diets, etc…and if you think about it, it has probably impacted rosacea to some degree because they are getting more nutrients and more fiber naturally but if we just make sure our colon is clean we probably have more flexibility and have less impacts on the skin. I will add that I eat very well, all organic, try to get non GMO, I eat no sugar except from fruit, and eat whole foods but I have eaten this way for a long time even when I had rosacea and it really didn’t impact it the same as when I increased my fiber. Only then did I see what I would call a cure. I would always cut as many carbs out of my diet because of weight control but this was wrong. I needed more fiber and I’ve found I lose more weight when I include it into my diet (good carbs though, not bread). I also “thought” that I ate plenty of fiber because I do eat a lot of veggies but I was wrong. When I finally calculated it over a days’ time, I ate less than 9 grams. Men need about 30-50 each day and women need about 25 -30. I agree with you 100 pct. The digestive tract is the key. I could never figure out why every time that I had something to eat my face would flush and my hands would get cold. The toxins were entering my bloodstream causing my circulation to go bad and thus I felt miserable. I also had a lot of problems with fatigue. I take probiotics and enzymes that help to break down the food that I eat. I notice that my hands don’t get cold anymore. I have just started to increase my uptake of fiber. Thanks so much for that tip. Things are starting to change. Thanks everybody for all your tips/suggestions. God bless you all! P.S. I was prescribed a lot of antibiotics when I was a kid because I had a lot of ear infections. Antibiotics destroy the good bacteria in your digestive tract. Its all starting to make sense. You’re welcome I hope it helps you! Please chime back in and let us know how it’s working for you. one thing to keep in mind is that your digestive system extends to your liver and kidneys, etc…. I have a feeling that others might have problems because they might have something up with other areas as well. Just a hunch I guess but something to consider. Since I have several autoimmune issues – I’m also taking something called modified citrus pectin to get a natural way to detox your body. it’s been pretty amazing because the whites of my eyes are more white and I have more energy (I thought of that when you said you had no energy). From what I read online. it’s made from the pith of a citrus fruit (the white part) and allows your body to naturally remove the heavy metals in your body from day to day life. You can take three scoops a day but to be honest it makes me feel ill doing it this way. I prefer to take one only. the customer service lady told me that one a day for three months removes all the toxins. Thanks for the information. I am going to an acupuncturist today. I had a flare up today. I took ibuprofen for low back pain, Im guessing that it had something to do with it. I have been taking a tcm herb to help detox the liver. Hi Doug – it was a matter of a few days. less than a week probably. I’m sure that if I stopped taking and tracking the fiber than perhaps it would come back after some time but I don’t let that happen 🙂 All of the things that made my face so sensitive before is also gone. I can drink wine with no issues with burning and swelling, my makeup/foundations would itch due to sensitive skin and that is gone as well. My skin is over all even and no redness. no spots, nothing…. I didn’t want to recommend a fiber pill because I don’t want people to think I get some kick back or anything but my brand I use is natural factors wellbetx pgx plus mulberry. I think I’ve found a lot of success with this one in particular but again I used others too and saw results. Did artificial lights – fluorescent lights, computers, etc make you red? If so, is that gone too? My biggest triggers are artificial lights. Hi – I don’t think artificial lights impacted me but when I was hot or out in the sun I would get impacted. That is gone now. It can be very distressing and frustrating, but there are things we can do to help it and encourage ourselves that there is more to life than our redness. I wish everyone luck with the experimenting to find the best ways to avoid redness, and increase confidence. Chad any luck with your new therapy? Does anyone know if taking a baby aspirin will negatively affect the probiotics I have been taking? Good question – I don’t know and I stopped taking it after I realized Fiber was my cure. What what is the best thing for rosace flushing?